Adoption loss is the only trauma in the world where the victims are expected by the whole of society to be grateful. Every adoption is built on a foundation of tragedy and loss. This is why the TLC television show featuring family reunification “stories of people who have, for one reason or another, experienced long-term separation from members of their family is entitled Long Lost Family [emphasis added]. Yet recently, someone took umbrage at my stating the fact – my truth – that I lost my child to adoption. “Lost?” asked the man with incredulous shock, somehow offended at my description of my experience. Maybe he was surprised because loss of a loved one is equated with death. Probably that combined with the prevailing fairy-tale, romanticized image of adoption as a win-win; a sum zero in which there are no losers. Women who are incapable of caring safely for a child, or simply don’t want to be mothers “chose to place” their babies for adoption to be cared for by desperately waiting persons or couples and they all live happily ever after. Powerful mythology tells us it is brave and it is loving. This is the image of adoption our culture has created and the public embraces tightly with certainty. Yet this powerful perception is smoke and mirrors. It is a construct to keep a thriving mega-billion-dollar industry – and those whose livelihoods depend upon it – flourishing. The truth behind the curtain is that adoption is not a win for everyone involved in the process. Never has been. Adoption is NOT a win-win, but involves loss for all parties. Some who adopt do so because since childhood they totally bought into this myth and they felt a life-long commitment to help the mythological “languishing” orphans. The vast majority adopters, however, (excluding step-parent adoptions) have lost their fertility, their ability to carry a pregnancy to term, or are unable to have a child of their own with their partner or spouse. They’ve lost the dream – often a lifelong dream – of having a family and a child of their own. Many have lost the dream of experiencing pregnancy, childbirth and seeing an offspring who might look like them or have familial and familiar traits. This is a grievous loss and one that cannot be underestimated or taken lightly. It is the loss of hopes and dreams. It is shattering for those who experience it. It often drives people to endure years of painful and very expensive infertility treatments and assisted reproduction solutions, leaving them heartbroken in the end. Some who chose adoption – as a last resort – experience a let-down after adopting that they liken to postpartum depression, though the causes are very different. Many are trying to bond having not had sufficient time or counseling to properly mourn their loss. Some adoptive parents admit that the longing and wondering what their own child might have been like lingers long after they have opened their hearts to a “replacement,” substitute child. For the mother who bears the child there is nothing but loss. My loss was half a century ago. 1968. My daughter was born in the Summer of Love. July 1967 and also during what some call the Baby Scoop Era (from the end of WWII to Roe v. Wade) because of the high number of babies lost to mothers who were deemed “too young” or simply “unwed” – judged immoral for the sin of fornication. For some the “cure” was a shotgun wedding. For many it meant banishment to a Home for Unwed Mothers and the ultimate punishment – permanent loss of your child into an abyss of the unknown and a lifetime of worry, wondering if your child was dead or alive, well taken care of or lost in the foster care system. After carrying a child for nine months, laboring and birthing and being left with empty arms, what else could possibly describe that but loss? In 1980, I was one of five such mothers in New Jersey who co-founded the original Origins, subtitled: An organization for mother who lost children to adoption.” Childless mothers. Much has changed over the decades and much has not. Birth control is more readily available, drastically reducing the number of unintended pregnancies and abortion is an option, currently, in most of the country. The stigma of being an “unwed mother” has all but disappeared except in some ultra-religious communities. Single parenthood is far more accepted and even applauded under the right circumstances – meaning if one is wealthy enough (think Sandra Bullock). And even those less financially secure can still continue to attend school while pregnant today, as they could not previously. The shame that drove everything about adoption underground and secretive and forced so many young mothers to lose their children, is for the most part in the past. No longer are mothers having to hide their “sin” as described so graphically in The Girls Who Went Away by Ann Fessler. Today we have MTV reality shows following young expectant moms as they make their decision to become mothers or make the very difficult, painful but loving choice to allow others to parent their child. Today most mothers in that situation can opt for “open adoption” which purports to spare them the torturous pain of not knowing the well-being of their child. Some open adoptions last. Some such arrangements are satisfying for both sets of parents. Others fail or were merely a false promise from the get-go, a pretense to pry a baby from a mother. Many young, naïve mothers-to-be believe that by choosing an open adoption they are entering into a binding contract that will make them akin to a non-custodial parent in a divorce when nothing could be further from the truth. No open adoption contact agreement is enforceable and cannot be because every adoption, including open adoption, begins with the mother and father relinquishing ALL their parental rights, rendering them legal strangers to their child. All rights then reside with the adopting parents – the only legal parents – who can choose to allow contact or not. Relinquishing parents, because they have no independent legal counsel, are often unaware of this and all too often enter into agreements that are not at all what they imagine it to be. Most have become enmeshed with prospective adopters throughout their pregnancies and feel a tremendous sense of obligation and indebtedness to them for the “kindness” and support – both emotional and financial. They believe these people who have “been there” for them when boyfriends or family have abandoned them, are their true friends. Far too many are left out in the cold, feeling nothing but emptiness, loss and betrayal when promises are unkept. No matter what type of adoption occurs – open or closed – the mother has experienced a grievous loss she will never forget. Mothers in adoption that remain open often feel pain seeing their child calling someone else Mommy, no matter how well-prepared they thought they were. The child that grew inside them is someone else’s. Someone else gets to marvel at all their milestones and gets the kisses and hugs. Even if they are recognized as the “mother” – someone else is Mom. And even if that is what they wanted for their child, it is bitter sweet and a loss of what might have been, could have been. Unlike other maternal losses – miscarriage, stillborn, loss of custody in divorce, death of a child – a loss to adoption is not socially accepted and there are no customs or rituals to mark the loss – no funeral, no grave. In fact, it is the only loss encouraged by society and funded by federal tax dollars. The loss of a child is not forgotten nor healed over time, but, in fact, is reported to worsen. The adopted child likewise experiences profound loss. The loss of the life he might have had, the loss of genetic connection to the family in which she is raised. In very real tangible way they lose their original identity, many adopted transnationally lose their heritage, culture and native tongue. They lose access to their original birth certificate, aka a vital record at least until adulthood and for some, depending on the country and state they were born in, forever. And most significantly, they lose their family medical history. Some adoptees have likened their life to a puzzle with pieces missing. Others to a book missing its first chapter. Many feel a sense of injustice for the denial of their truth, including their grief. Children may feel grief over the loss of a relationship with their birthparents and the loss of the cultural and family connections that would have existed with those parents. 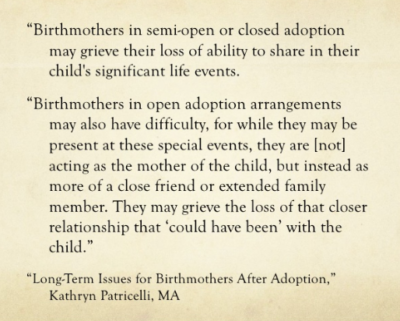 This feeling of loss may be especially intense in closed or semi-open adoptions where little or no information or contact is available with birthparents. Such grief feelings may be triggered at many different times throughout the child’s life including when they first learn of their adoption, during the turbulent teen years, upon the death of other family members, or even as when becoming a spouse or parent. Some who are adopted experience an initial separation and one or more subsequent separations and losses before – and even after – being adopted, but even one of these can have a profound emotional toll. “Neglect, abuse, violence and trauma endured early in life can ripple directly into a child’s molecular structure and distort their DNA, according to a new study this week from the University of Wisconsin-Madison. “The genetic changes leave them biologically more vulnerable in later life to psychiatric afflictions like depression, anxiety, mood disorders and high-risk behavior like drug abuse, the researchers found.” Childhood trauma leaves scars that are genetic, not just emotional, study affirms. 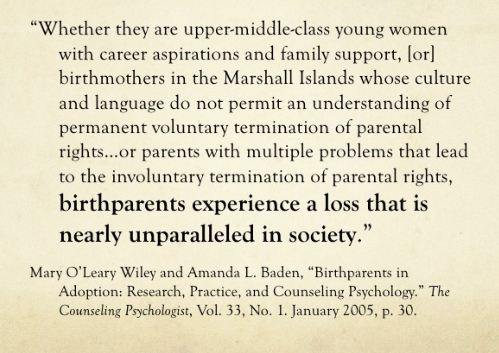 Every separation from primary caregivers is a traumatic loss, no matter when it occurs – even at birth. For newborns, accustomed to the smells, sounds and motions of the mother in whose wombs they grow, it is called a primal wound. Adoptees are burdened not only with ignoring their losses, in most cases, but dealing with society’s expectations of gratitude. They are imposed with feeling grateful they were not aborted when their chances are no greater than anyone else’s. They are told they are lucky not to have lived a life of assumed abject poverty or abuse or neglect had they not been adopted. For me, being an adoptee is like getting into a horrible car accident and surviving with devastating injuries. But instead of anybody acknowledging the trauma of the accident, they tell you that you should feel lucky. Even if the injuries never stop hurting, never quite heal. Even if the injuries make it impossible to feel comfortable in everyday life. . .
Adoptees are often so busy trying to prove that we’re fine, that it’s too late when we realize we’re not. When I say I feel I don’t belong anywhere, you say I feel lucky to be adopted. When I say I consider myself a commodity, you say I actually feel like a gift. When I say I long to connect with my birth family, you say “those people” mean nothing to me. When I say I miss my original mother, you say I have abandonment issues. When I say I mourn my bio-father, you say I cannot grieve someone I never met. When I say I carry great pain, you say you wish you were adopted. I think for many adoptees we have grown weary of being told how to feel. Adoption has been painted as a win-win for all parties and a wonderful way to create families for so long the under belly of adoption not been revealed. . .
Loss is loss. You don’t tell someone who lost a leg to be thankful for their prosthetic, or tell someone who has lost one kidney to be glad still have one left, or someone who lost a child that they have others to be thankful for. Even IF there is some reason to be thankful for that it doesn’t diminish the initial trauma and loss. Loss, is loss, is loss, is loss and will always BE loss. Some losses are greater than others certainly. We can measure and compare them, but they are all still loss. Yes, what we do with it makes the difference but that will never erase the initial loss. Diminishing initial loss for adoptees can further undermine their feelings and emotions leading them to question even more who and what they are. … If adoptees are shamed into believing some of the most basic and primal parts of themselves are wrong then they begin to trust in others rather than themselves. In the adoption process, there are two parties with power and two parties without power. The agency or attorney and the adoptee parents have the power and gain the money and the child. The birth parent and child do not have any power. Whether the decision was forced, surrendered or relinquished, given up….both the powerless parties feel an incredible loss on so many levels. That is a fact that can’t be denied, even with the best adoptee parents, issues of trust, loss, abandonment, grief of questions unanswered will always be there for both the adoptee and original mother. I don’t think this is a debate on positive or negative adoptions. This is speaking to the underlying life-long effects of losing, surrendering, being forced, relinquishing a child no matter what the reason. These psychological and emotional effects do not go away. I have huge amounts of adoptee friends and in that group, [even among] those who have found their birth families. The life long search for self is real, the life-long grieving on both parties is real even if the child got a “better life or family or opportunities”…the psychological/emotional struggles are real. Adoption loss is real. It cannot and should not be denied. We need to leave the win-win myth where it belongs: with other childhood fairy tales, Santa Claus, Easter bunnies and unicorns, and face the realities of loss and grief that is a very real part of every adoption. 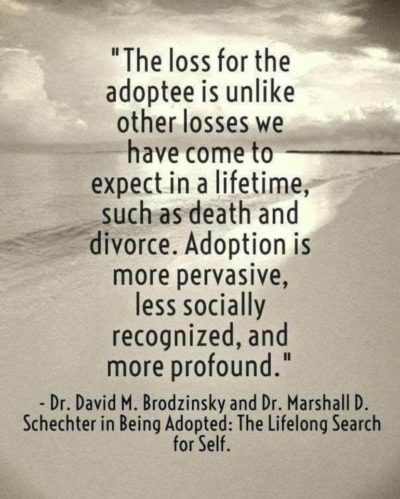 The profound loss for all of the parties to adoption is a reality that needs to be recognized within adoptive families, by society, and in our legal system. This article was posted on Monday, July 30th, 2018 at 6:49am and is filed under Adoption, Children/Youth, Culture.